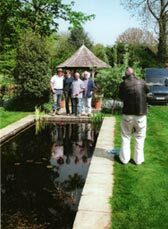 In March 2006 CVAHS were asked by the Time Team (TV Channel 4) if they had any interesting excavations, and Chesham Bois House was mentioned. They came down and decided to undertake a programme on 8th May which left very little time for the necessary preliminary research to be carried out. Fortunately Roy (sadly died in early 2005) and Anne Paton’s research proved very useful. 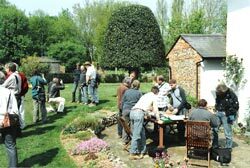 On 8th May about 50 people involved with Time Team came and started digging and filming. After a geophys and underground radar survey they dug up the newly filled in trench to expose once more the medieval hearth and excavated westwards. They found a large oven containing 5 compartments and in the diary of Anne Cheyney the doyenne of the house mentioned that they baked 69 loaves of bread a day, 10 of superior flour for the household and the rest for the servants and people in the surrounding area. Two more trenches were dug which uncovered the outer walls of the house as well as 3 trenches in the field in front of the church on the other side of the drive. At the end of their three days of filming all the trenches they had dug were filled in. The TV programme was shown on 18 March 2007 and is shown from time to time on the More4 TV Channel under the title The Cheyne Gang.